NordicTrack GX5.0 Recumbent comes with both - Contact Grip and Wireless Chest Strap HR monitors giving you the convenience of the handle grip monitors and the more accurate chest strap monitors, which also frees up your hands for other activities such as reading, reaching for your water bottle, using an iPod or TV remote. 5″ Backlit Display-Track your total calories burned and your workout progress on this large, 5″ backlit display. Transport Wheels-Quickly move the GX5.0 Exercise Bike from room to room with these built-in wheels. 24 Digital Resistance Levels-Burn more calories with the touch of a button. Adjustable resistance controls quickly add intensity to your workout and personalize your results! 350 lb. Weight Capacity-Built to withstand heavy use, the GX5.0 Exercise Bike accommodates up to 350 lbs. It’s perfect for every body. 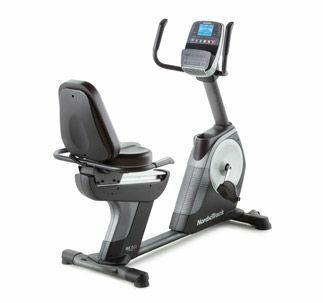 Recumbent Design with Oversized, Adjustable Seat-Drop the pounds in comfort with the chair-like design of the GX5.0 Exercise Bike. The oversized, cushioned seat is built with lumbar support so you can stay relaxed and focused on your weight-loss goals! Inertia Enhanced Flywheel-Engineered for incredibly smooth performance, this inertia enhanced flywheel delivers a more natural ride. You’ll feel the difference in your first workout! California Prop 65 Warning-WARNING- This product contains one or more chemicals known to the state of California to cause cancer, birth defects or other reproductive harm. Warranty-The GX5.0 Exercise Bike is protected by a Lifetime Frame Warranty, 2-Year Parts Warranty and 1-Year Labor Warranty. 30 Workout Apps-Burn maximum calories and increase your fitness performance with built-in workouts designed by a Certified Personal Trainer. Choose from 30 workouts that target calorie-burning and aerobic goals. iFit Live Technology Compatible-Train for your next race or favorite event in the comfort of your living room. Powered by Google Maps, workouts recreate the route, automatically adjusting the resistance to match the intensity of the terrain. Choose a pre-drawn training program or draw a map anywhere in the world! CardioGrip Heart Rate Monitor with Wireless Chest Pulse Included-Stay in your target heart rate zone with heart rate sensors built right into the handlebars. RaceTrack Display-Track your progress on a track-style display! It’s easy to monitor your speed, pace and distance with this visual, quarter-mile racetrack. CoolAire Workout Fan-Stay cool while you drop the pounds with this built-in fan that features two speed settings. Step Thru Design-Get started on your workout fast! Step Thru Design eliminates the traditional bike base so it’s easy to get on and off the GX5.0 Exercise Bike. Compatible Music Port for iPod-Move to your favorite music with the built-in Intermix Acoustics 2.0 sound system. Two 2″ speakers deliver incredible sound to keep you motivated to reach your goals! *Note: Most of the sites, stores or shopping portals listed above sell NordicTrack GX5.0 Exercise Bike with discounts and other exciting offers. There is a possibility that the some of above websites are not selling NordicTrack GX5.0 Exercise Bike now. Toughtrain.com is not liable for such cases or instances. Also we do not recommend any seller for NordicTrack GX5.0 Exercise Bike and a buyer should buy from where he/she gets best deal with quality of products, service and on time delivery (shipment). What most impressed me about this exercise bike is its elegant look, specially the comfortable cushioned seat. 2 months back had an issue with its display for the first time and apart from that no serious threat has occurred. According to me it should be awarded 4 out of 5.